It’s time to get a little weird, and a little wild, with Disney XD. While the Marvel and Star Wars franchises continue to grow (and dominate) for the channel, they’ve also shown a continued support of original ideas. The newest of these debuts Monday March 30, 2015, and brings a magical princess from another dimension into your TV sets, and I guarantee, into your hearts, too. 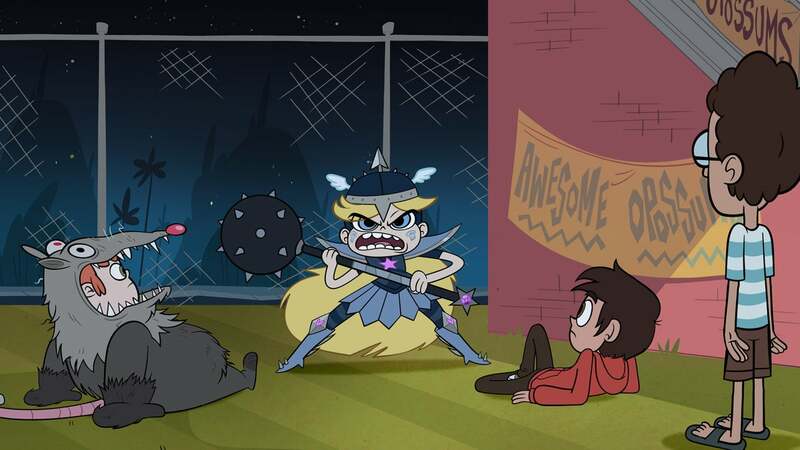 Star Vs. the Forces of Evil is, in the parlay of comedic genius, something completely different. It’s a magical girl show, but one without heroic antics or starry-eyed love stories. It’s an action show, but one without the burden of taking itself too seriously. It’s a comedy, and it’s one that will make kids and adults alike laugh out loud, even on the inevitable repeat viewings. To check out this new breed of (non) hero for Disney XD, we talked with creator Daron Nefcy. 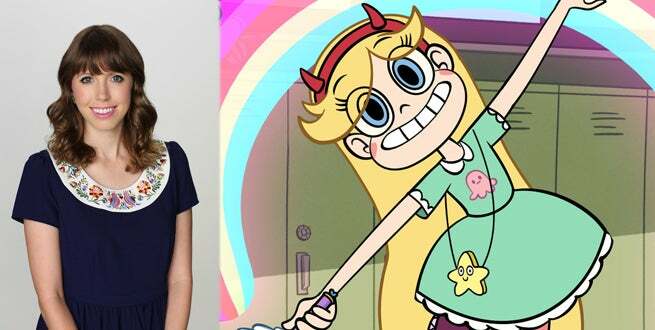 She talks about Star’s very different origins, getting a second season pickup before the first began airing, what make Star Butterfly and Marco Diaz so great, and why all she needed for success was a little bit of magic (and the help of a large, dedicated team). She even brought along an exclusive clip from the debut episode, and some still shots that show off some of the supporting cast. But first, we talked about that amazing, catchy theme song, so watch the intro then read on. Daron, ever since the theme song/intro played at Comic-Con last year, people have been waiting for this show. What was it like to see a response to a literal minute of the show like that? Daron Nefcy: It was great! I was really blown away, especially because what ended up online was someone’s iPhone video, and the beginning was cut off, the quality wasn’t that great, but people started doing fan art and getting really excited just off that! It was so cool. It’s great; when you make something you hope people will like it and you never know, so to get that instant feedback was really amazing. DN: (laughs) Oh my gosh! Well, I hope that’s true! I really like the theme song. The theme song process was really fun, it was probably one of the most fun things we did. The music department here said, “okay, we have like fifty people that submitted theme songs for your show!” Then you are just listening to these – and these are just the ones they’d already weeded through. There were so many good ones! The one we ended up with was my favorite, but there were so many others it was really hard to decide on. The same composer who did our theme song, as it turned out, is the same one who did the Gravity Falls one. But when we were listening to it we didn’t know, because we just listened blind. But yeah, he’s really talented, Brad Breeck. That had to be a crazy moment, listening to people who made music inspired by your creation. DN: Yeah, it’s awesome. It’s really cool, how a lot of these processes work. It’s the same thing for the composer of the show, Brian Kim, who is also incredible, we got to hear about 10 people score the first episode, and pick out of that. It’s cool to hear different people’s take on it and make a decision. Tell me a bit about Star’s origins; I know you’ve said she’s been on your mind for several years now, and she has changed a bit since your original ideas and pitches of her, right? DN: Yeah, that’s correct. I came up with her in my third year of college. A friend of mine who was working at Cartoon Network told me about something they were doing called Cartoonstitute – they were going to be soliciting a bunch of pilots. So I came up with the idea for Star – she was a little doodle that actually I think I came up with before that, just started drawing this girl with heart cheeks and stuff like that. I don’t think she quite had the devil horns yet, but she had the heart cheeks! So I came up with this little idea for her – she was actually going to be younger, a fourth grader. She was basically going to be me in the fourth grade: I was obsessed with Sailor Moon, and had really convinced myself that I was going to find a talking cat any day! (laughs) So that was the original concept, she was convinced she was a magical girl sort of superhero, but really wasn’t. So that concept has obviously evolved a lot over the years. She became older, and the world changed. That was something that actually came up when I started developing it at Disney; someone said, “well what if the magic powers were real and not just all in her head?” I had to really think on that, and then turned it around in a week. That’s sort of how the recent concept unfolded where she’s from another dimension, she’s a foreign exchange student, and has this magic wand that’s her birthright – all those details came up in that. 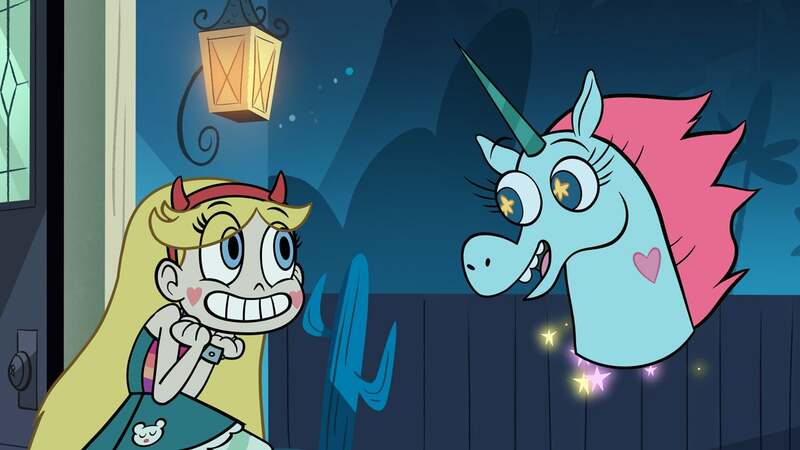 Exclusive Clip: In "Star Comes to Earth/Party With a Pony," as tradition dictates, Star receives the royal magic wand for her 14th birthday, but her parents worry that she is not ready for the responsibility and send her to a place they deem safe – Earth. Then, Star's best friend from her home dimension pays a visit and feels threatened by Star's new friendship with Marco. That makes me really happy, that personal origin story. So when someone at Disney made that suggestion did things just kind of unlock for you and fall into place? DN: Yeah, it definitely – it’s funny, I think I’ve told this story before. But developing a story takes a long time. I pitched it, got suggestions, went over it, pitched it again… then I was finally going to meet Eric Coleman, and there was this meeting where the other executives I was working with were going to be there. They reassured me, “oh, this is going to be really chill – you’re in development now, you’re part of the pilots we’re developing now.” They said I didn’t have to pitch anything, “it’s fine!” So right before they come in, one of these other execs says, “So we’ve been thinking about it and think it would be really cool if her magic was real.” And I was sort of like, “oh, okay” because it’s completely different from what I’d been developing. So Eric comes in, sits down, and says, “What’s this about? Pitch me.” So I tried to pitch it on the spot with her magic being real, and that did not work at all. I totally messed it up, but said I’d fix it, and brought it in again the next week, and they really loved the concept. I like where it ended up, I think it was a really good suggestion. When did Marco come into the picture for you? How did he balance out the idea of the show? DN: So Marco was really there from very early on, but was conceptualized totally differently too. 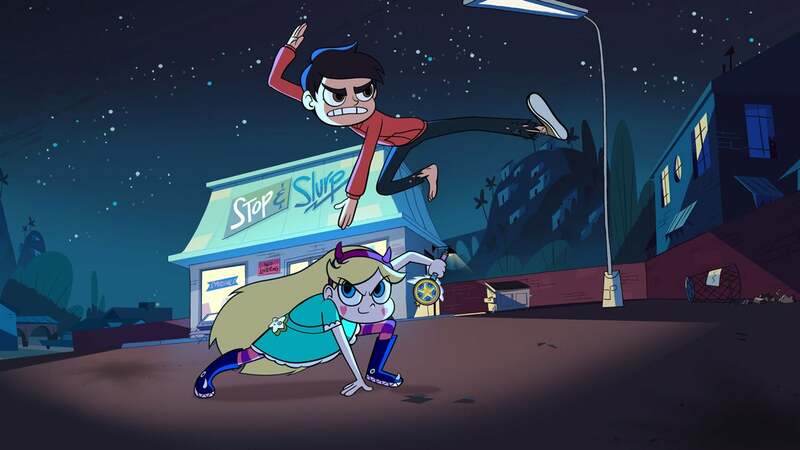 So if Star was going to be the Sailor Moon girl, Marco was going to be the kid obsessed with Dragon Ball Z, which is kind of where the karate thing came in. He actually had a different name, too, originally his name was Sol, because I liked that she was Star and he was Sol like the sun, I thought that was cute. So how did their relationship develop for you, into what it is now, where they’re reluctant-at-first friends? DN: Well, when I decided she’d be this foreign exchange student, and they were older, it didn’t make as much sense for him to be this DBZ-obsessed kid. I needed someone to balance her out, as this alien girl coming to Earth; when it became that story, you have to have the straight man a bit. Marco has always been quirky, and that stayed but he’s more of the straight man. You got a season two order before the official launch even hit. When did that news reach you, and what kind of freedom does it allow for you while working on the show? DN: Yeah, that was awesome! It’s really exciting and my team is really excited about it. We’re still post-producing season one, so it’s a little nonstop! (laughs) But it’s cool, I’m lucky I have a really great creative director Dominic Bisignano, and my supervision producer is really fantastic – they were sort of in the trenches with me the whole first season. Now it’s exciting because they helped a ton first season, and now I get to give them better positions season 2 so they can really help me. We just got a new story editor and a post-director; it’s definitely more help to free up time and makes it a little easier, but it’s all a lot of work! What was it like pitching a brand new hero to Disney XD, where they already have tiny properties like Marvel and Star Wars? DN: (laughs) Well, actually when I originally pitched Star it was for Disney Channel, and it was for Disney Channel for a long time. But Disney has been making XD – which I think is a really great idea – their main channel for animation. So before you’d have some animated shows on and live action shows and it might not get the right audience. But now the animation is all in blocks together. The XD thing came a little later, but I think it’s a good fit for Disney XD! It’s a pretty cool thing to see an action animated series centered on a female character, too. DN: Yeah, I think it’s really neat, and I am glad it didn’t scare them! It’s been cool, in the process, I’ve gotten to work with all the great departments that Disney has, from Cecilia and Dana who do these interviews, and Vincent and Jill who work on the Commercial side of it, they’re working on games, there’s a game department working with Star; there’s all these great departments working on these things, which is really neat. But all these departments are really excited about that! No one has ever gone, “Oh we need to make sure the commercials trick kids into thinking it’s a boy show” or something (laughs). Everyone has been really great, saying “Star’s the lead, and we need to really make her shine!” Which is awesome. Alongside Penn Zero, Star is really presenting a new breed of hero or powered character on the channel and in general. Why is now a good time for these new types of heroes, these kids that are more about having fun than necessarily saving the day? DN: You know, I don’t know! I can’t speak for Penn, but I know that Star, for me, it was always important for her to have flaws, and have those aspects of being a real girl. Star and Marco need to be real kids – and a lot of Star is based off of me! Then there’s a little bit of my husband in Marco, and there’s a lot of what the writers and the storyboard artists bring to the show and the characters, which is really awesome. It’s funny, with Star, one of my big things with her is that she’s not a superhero, and she doesn’t save people – it’s not something she’s particularly interested in! It’s funny, it’s a weird show in a lot of ways, because there are things I just didn’t want to do with it. So she has magic powers, but I didn’t want that to be a secret. So many shows, if you have a kid with magic powers, the whole premise is keeping it a secret. So the kids know about her magic powers and it doesn’t bother them much. Then she has these powers, but she’s really not saving anybody, she’s just trying to go to high school; she’s just getting rid of villains when they’re attacking her specifically. She’s not out to take them down – or she doesn’t want to be. It’s kind of cool, in the second season, we’ll go a bit deeper into that. But yeah, she’s in it for herself a lot of the time, which is pretty true to being a teenager. And even Marco’s parents know about her powers explicitly from pretty much the beginning. DN: Laser Puppies. So cute! Yeah, I just talked with the Penn creators too and I think that the underlying optimism between the characters of those two shows is really refreshing and important. DN: Yeah, I think that there’s some of that to Star. Not to – this is so far away! – but again in the second season, she continues to mature. She does mature in the first season. I think what audiences might find fun is that there is an arc that begins to develop in the first season, a story that will build to a big finale – there is a story that goes through the first season, that I hope people will see! It’s there! After thinking about and working on this character for so long, what was it like seeing her come to life, and hearing a voice come out of her mouth courtesy of Eden Sher? DN: It was really cool. Before even the television show, I got to do a fully animated and produced (unreleased) pilot at Disney. That was really cool because I got to work out some of the problems in the way we were animating the characters, and Eden was there from the get go, she was there for the pilot. It was really amazing. That’s why I love animation! I went to CalArts where I was doing student films every year, and I was doing every part of the process, the writing, the animating, the boarding, every single thing. But that’s what’s great! I love that you really get to play God and do every single thing – this existed out of nothing, and then you get to create something and see it come alive. Yeah, that sounds like an amazing moment. Eden is great as Star, and I know you said when she came in she was the bubbly character you wanted already. How much development of the characters do you wind up doing after the actors are cast, working with them on it? DN: What I think is cool is that we do that, it develops over time. For me, I like to see that if the actor sees something in particular, I like to do more with that. I’ve told this story a couple times before, but it was really cute: Eden, when we were giving her notes, or telling her about an episode, she’d just go, “Oh totallytotallytotallytotally.” It was cute! So we started writing that into the script for Star to be saying that! It’s great. We try to feed the characters off the actors and they feed off the characters, and in the best circumstance it becomes this symbiotic thing. Star has been so perfect for Eden, she brings so much to it. We knew it was her off the bat, too. 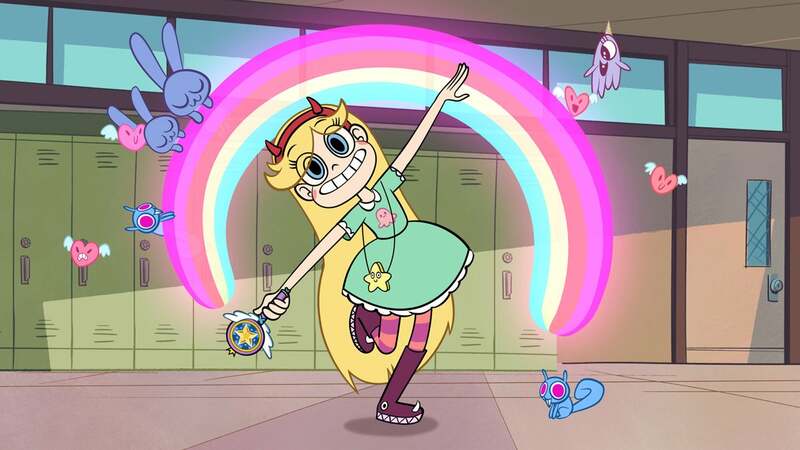 We had so many actresses come in, and a lot of them were really great, but she has this quirkiness that makes Star this unique character. Likewise, Adam McArthur seems to have a really tough job with Marco, since he seems to be the only person on the planet that is surprised about Star and what she does! DN: (laughs) Yeah, and Adam really brings something special to that character, too. With the wrong acting, Marco could be a super-nerd, or really unlikeable. One of the things we always try to give Marco is that he’s smart, and he’s really thinking about the world around him – there’s almost this existential Charlie Brown-ness to him that I really like. I think Adam really makes that obvious, and makes that charming. I think with the wrong person the character wouldn’t feel that way. While Eden and Adam are wonderful, I think that Jenny Slate as Princess Pony Head was possibly the most brilliant idea in a show full of brilliant ideas – how did that character come about? DN: It’s funny – so Pony Head originated in the very first version, when the magic powers weren’t real. When Star was this really crazy fourth grader who was imagining that she was Sailor Moon, Pony Head was going to be the kind of “don’t give up” character. That’s where she originated, but when the powers became real We said, “oh, let’s bring Pony Head back!” But I guess we can’t make her dripping with blood now. DN: Maybe not so horrifying for the kids show! (laughs) But yeah, I love Pony Head, and Jenny is just awesome. She’s so funny. She was one of a number of people who tried out, and was just awesome. DN: Yeah, I’ll have to put some of that artwork up on my blog, my Tumblr. Since Pony Head was a breakout star, you gotta bring her back, right? DN: Oh yeah, she comes back in the first season, there’s a two-parter that really gets into that, but I don’t want to give anything away! She’s also going to be a big part of the second season. Awesome. Any other little teases or anything you didn’t get to talk about that you’re really excited for people to see? DN: Well, you know, I’m just excited for them to see the show! First seasons are tough, they’re really hard to do, but I’m really proud of my staff. This crew – it takes a lot of people to make a TV show and all those people need to work really hard to make it happen. Then for it to be a good show, it’s great that my staff all put in the extra effort. So yeah, they’re awesome! Watch the premiere of Star vs The Forces of Evil on Disney XD Monday March 30, or watch two full episodes now on WatchDisneyXD.com!